Laaaawwwdd. I feel as though I have been through hell and back this week. Glamazon head cold + plus getting a cavity filled while ill + the boy getting the same head cold + plus still being infected with this head cold = rough week. I swear I feel worse today, than I have all week. Tres ridiculous. With both of us being ill up in here, the only thing I have had on the brain for nourishment would be soup. Shocker. Spicy, spicy soup. I made this for dinner last night and it was beyond fabulous from what I could taste of it. Ok actually, I could try this in a few weeks once I have full tasting ability back and it might taste like garbage. Hmmmm. Not a credible source I guess. Let's be honest, these taste buds never fail me. They are all I have! But seriously, it is great. 1. In a large pot, heat the olive oil under medium-high heat. Add the onion, garlic and jalapeno. Cook, stirring, until the onion is translucent, about 5 minutes. Add the chili powder, oregano and cumin; cook 1 minute more. 2. Stir in broth, tomatoes, chiles, beans and salt (and Rotel if you added). Bring to a boil, then immediately reduce heat and simmer for 20 minutes. Add the chicken; simmer 10 minutes more. Stir in cilantro. 3. Ladle into bowls and garnish with avocado, cheese and lime wedges. There should be a step four like fellow patient zeros like myself, blow nose incessantly. This soup is seriously so fantastic I know you will adore. We (and by we I mean Matthew) make a really similar soup! I'll have to try this one out next for some variation! Aww feel better soon sweets! 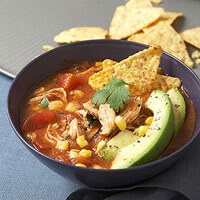 I love a good chicken tortilla soup, the spicier the better! looks deeeeeeevine!!! i cant believe your not feeling better yet!!! Okay - I'm a huge fan of tortilla soup & this looks ridiculously good! Get to feeling better soon!! Just love a good bowl of chicken tortilla soup! Makes everything betta! OMG YUM. This sounds awesome. I love making big pots of soup in the fall then living off it for days at a time! Definitely going to try this one soon. thanks love! Can't say yum big enough..........have to try this. My fave! I make the same soup! It is a perfect fall comfort soup! YUM! Hope you feel better soon! Thanks for finally writing about > "Chicken Tortilla Soup for the Soul" < Liked it!